Welcome to a Hachette Group Early Birds Blog Tour for Sarah Dunn’s Secrets to Happiness. 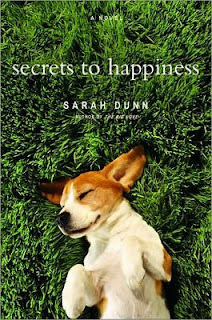 Secrets to Happiness by Sarah Dunn focuses on the life of Holly Frick and each of the people she effects with her decisions and how their decisions impact her life in a gigantic web. From Holly’s ex-boyfriend Spence Samuelson to Betsy Silverstein and her friends Amanda and Mark to her screenwriter/partner Leonard. Each of these characters is dissatisfied with their current lives and is seeking happiness and contentment in their lives. Dunn has a great talent for description and character development. Secrets to Happiness delves into the various situations, emotions, friends, careers, and other elements in people’s lives that they believe make them happy. Each of these characters experiences turns their preconceived notions upside down, leaving Holly, Spence, Betsy, and Amanda to make pivotal decisions. Overall, Secrets to Happiness reads well with a modicum of interruption from narratives that scope farther back into the lives of the characters. While some of these narratives, which mirror background checks for the characters, are well written, readers could find them distracting and unnecessary. Dunn is a talented women’s fiction writer with a flare for dramatic and unconventional characters, and her ability to dig beneath the surface of these professional New Yorkers is uncanny. Hachette Group was kind enough to offer 3 copies of Secrets to Happiness by Sarah Dunn to 3 of Savvy Verse & Wit’s U.S. and/or Canadian readers; no P.O. Boxes. 1. Leave a comment on this post about what makes you happiest about your life. 2. Become a follower of the blog or if you follow, let me know. 3. Blog, tweet, or spread the word about the giveaway and leave me a link here. Don’t forget my 2-Year Blogiversary Giveaway, go here for details.